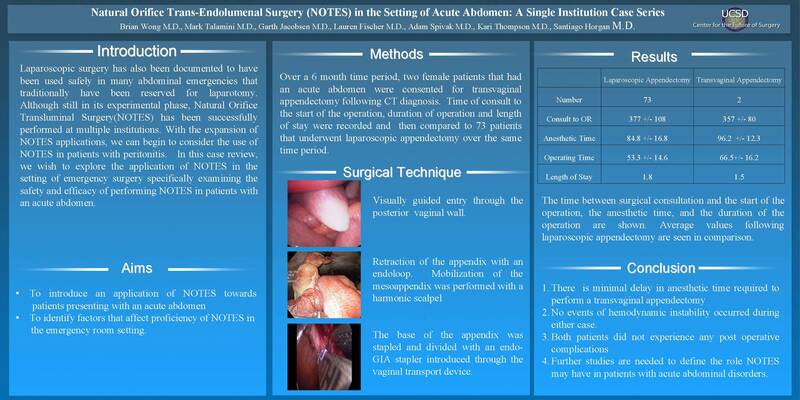 Laparoscopy has provided a means to assist in the decision-making process for patients with acute abdominal pain. Conditions such as appendicitis, diverticulitis, cholecystitis, small bowel obstruction, perforated viscous, endometriosis, and ovarian cysts can now be safely diagnosed and treated via laparoscopy. With Natural Orifice Transluminal Endoscopic Surgery(NOTES) considered as the next frontier in minimally invasive surgery, our goal for this project was to examine the role that NOTES may have in the setting of emergency surgery. Transvaginal appendectomy was performed in two patients that were diagnosed in the emergency room by a general surgeon. Time from emergency room to operating room was documented along with operating times and outcomes. Laparoscopic assist (Hybrid Technique)was used in both patients through a single 5mm umbilical port. Special attention was paid to sources of delay that apply to NOTES approach. Both patients were found to have acute suppurative appendicitis. CT scans were perfomed in both patients by the emergency room physicians. Average time from emergency room to operating room was 180 minutes. Average operating time was 88 minutes. Both patients were discharged on post operative day number 2 without complications. Delays related to NOTES include patient positioning and having a sterile endoscope available for surgery. In the absence of hemodynamic instability and serious co-morbidities, laparoscopic procedures can be safely performed on abdominal pathology requiring emergency surgery. With appropriate selection of patients and an experienced surgeon, we believe that NOTES can be a safe diagnostic and therapeutic alternative in the setting of an acute appendicits.